As the competition surrounding autonomous vehicles intensifies, Mercedes-Benz Vans on Monday unveiled a hybrid strategy around a self-driving platform that targets both passengers and cargo. 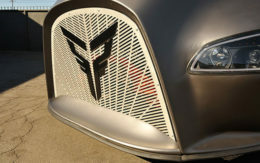 Dubbed “Vision URBANETIC,” the design centers around a self-driving, electric chassis with a modular capability. One module can be placed on the chassis to enable a ride-sharing vehicle for up to 12 people. That can be swapped out for a module with space for up to 10 pallets. In either mode, the vehicle is connected to a cloud-based platform that allows for real-time data collection and analysis so operators can adapt the routes and timing of the fleet. By having a unified system that can adapt to passengers and cargo flow, Mercedes-Benz officials said they believe it has the potential to reduce traffic in big cities. Mercedes-Benz showed the system in advance of the IAA Commercial Vehicles show, which is scheduled to start on Sept. 20 in Hanover, Germany. Autonomous and connected vehicles are expected to be a big part of the show as various competitors and partners try to knit together the pieces necessary to advance the technology for deployment. Mercedes-Benz said its interchangeable driverless configurations should be a boon both to truck companies struggling to find enough drivers, and last-mile delivery companies who currently rely on private ridesharing services or bicyclists. 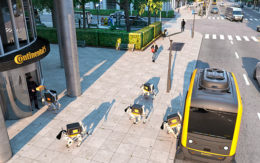 By eliminating the cost of a human at the wheels, such vehicles could be circulating around the clock, offering both long-haul and last-mile delivery at significantly reduced prices. 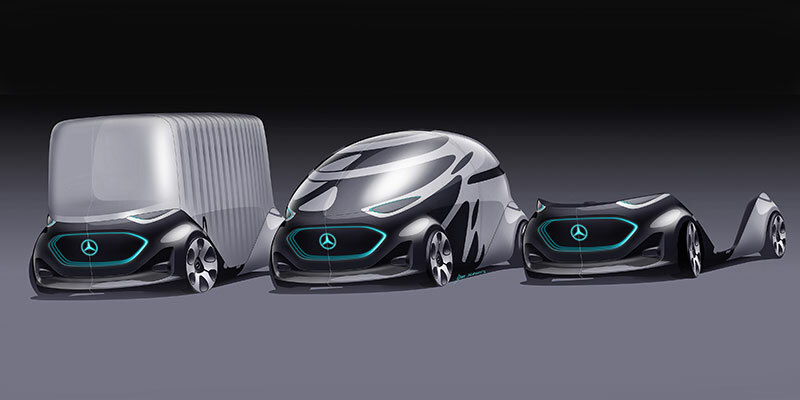 The company hopes the modular design of the chassis will encourage more innovative designs both from Mercedes-Benz, and potentially third parties. 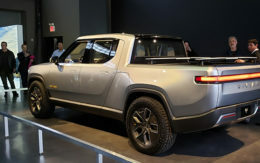 The company did not offer a timeline for when the vehicles might be available or a cost. One other interesting twist being offered by this concept: External communication. Mercedes-Benz said the vehicles include sensors and cameras not just to observe elements, but also to signal to pedestrians via a large display that it has spotted them. Mercedes said it hopes the feature will help build confidence and trust as people spot more of the vehicles on the roads in the coming years.